Ah, Tetris... Like an old friend returning after a long time away. The first experience I had with the franchise was with the Game Boy version, and the last time I played Tetris was on the DS with its Nintendo-themed visuals. 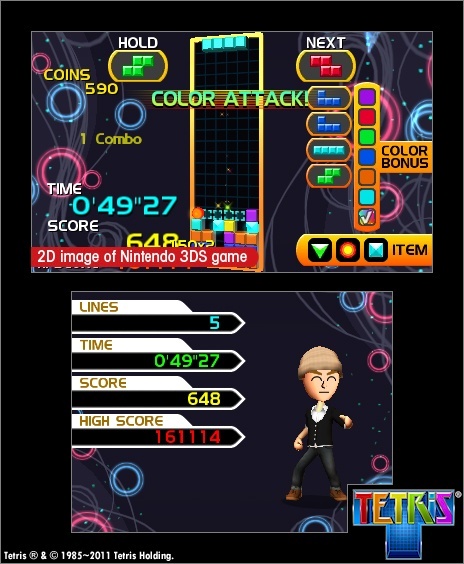 Now it's time for Tetris: Axis, the 3DS installment. Let's see how well it stacks up (as if the headline doesn't already answer this question). This version of Tetris stacks up pretty well. Tetris by now is a household name. You can play it anywhere and everywhere from the Wii to the DS to the original Game Boy to the Nintendo Entertainment System. Each version brings with it new challenges and modes specific to the platform it is on. This is no different with the release of Tetris: Axis, the now-defunct Hudson Soft developed, Nintendo published game, Nintendo 3DS iteration of the popular puzzler. Is this new entry of the long-lasting Tetris franchise worth the thirty dollar price of admission? For those of the uninitiated, what is Tetris? Traditional Tetris is a puzzle game where the goal is to place Tetriminos, differently shaped blocks coming in the varieties of S, Z, J, L, I, and square blocks, down and create horizontal lines across the board to clear them. The game ends when Tetriminos stack up to the top of the screen, so it's important to be fast, vigilant, and strategic when placing down the blocks. 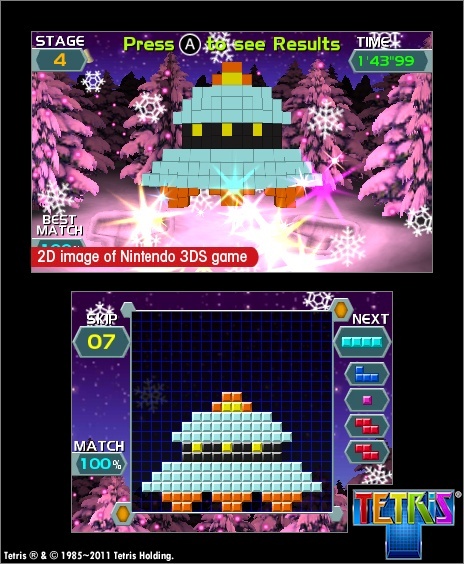 Players can rotate the Tetriminos clockwise or counterclockwise via the A and B buttons. At any given time a player can hold a Tetrimino in their possession and use it whenever they feel like it. This is great when the Tetrimino the player is given won't fit on the current board the way they like, so they can hold it to use later on for when it will. There's twenty modes total, far outperforming the DS version which only had six. They come in Featured and Party mode variations. The goal of Marathon is to clear as many lines as possible. After ten lines are completed each time, the speed of the falling Tetriminos goes faster and faster. The game is over once the Tetriminos stack up to the top of the screen or when the player clears 150 lines. Face off against ten AI-controlled battlers in a Tetris fight to the finish. As the player clears lines, the lines cleared move over to the computer's side and vice versa. The goal is to make the other player's board get filled with so many Tetriminos that they stack up to the top of their screen, making them lose. Items can be used (which I'll broach about later) to accomplish this task even more easily. Battle the AI in one fierce fight for the ages! The board in Fever mode is narrower than in a normal Tetris game. The premise here is to clear as many lines as possible within a sixty second time frame. Coins can be collected and exchanged for beneficial items. Survival has players fending off lines coming up slowly but steadily from below while playing in a narrow board (or Matrix as the game calls it). The goal here is to clear as many lines as the player can while staying alive so to speak. To complete the many levels of Jigsaw mode (there's approximately twenty different puzzles here) a player must look at the bottom screen at the picture shown as a reference. On the top screen they'll receive different parts of said picture and must recreate the portrait shown before time runs out. An incorrect placement of a block will take away time from the clock. The first few puzzles are simple to complete, but they quickly become more challenging with differently shaped blocks, more complex and complicated pictures, and stricter time limits. Fit Tetriminos against the shadow in the background to clear this mode (usually an object like a house or animal like a baby chick). Players can pass on a given Tetrimino only so many times, so it takes planning and strategy to get a 100% completion rating and a respectable time. Any piece placed outside the shadow will take off a percent point from the completion rating. Shadow Wide is a fun, if not challenging, mode. Place Tetriminos into gaps. As players reach higher levels, more blocks must be fitted inside the board, and the time becomes stricter. Place Tetriminos as stepping stones for the climber to reach the top of the cylindrical Matrix. Along the way he'll need to pick up heart icons to boost his stamina. Blocks must be placed in a fashion so that they act like a natural staircase for the climber. The climber can walk left or right and can change direction through the player's placement of their Tetriminos. Go for the best time. On certain parts of the Tetriminos are little bombs that will go off and create a chain reaction when more than one line is cleared at the same time. Clear as many lines as possible until the final block that flashes is cleared. Then the game will be won. Rotate and guide a falling Tetrimino through a maze of blocks. Move too slowly and the block will touch the top of the screen, meaning the player loses. Players can collect jump tokens to allow their Tetrimino to hop over obstacles on their way to the goal. There's over nine different difficulties and labyrinths to play through. 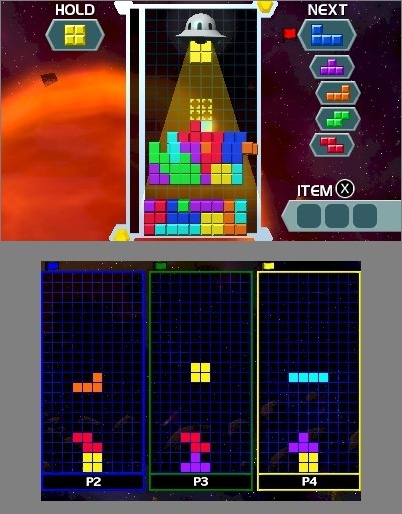 This mode is one of my favorite additions to Tetris: Axis. The goal here is to cover both the front and back of stars on the Tetris Matrix to collect them. A player's high score is based on the speed in which this task is accomplished. To complete this, the board must be flipped occasionally. The ultimate challenge recommended for expert players only. Tetriminos fall at the speed of light-- in the blink of an eye-- and it's the player's goal to survive as long as possible and clear as many lines as they can. Easier said than done with the swiftness that these blocks fall! The job here is as simple as clearing forty lines as quickly as possible. Going for the best time is the aim of this game. An augmented reality mode, place the AR card packaged with the player's 3DS to set up a digital board on a real time environment. Then they clear as many lines as they possibly can as they go for the top time and clear fifty lines. 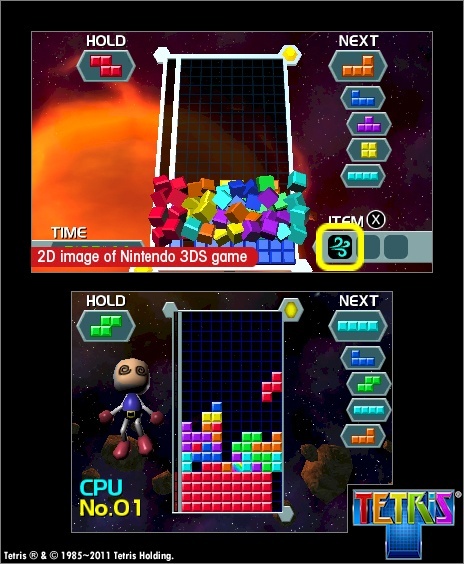 dimension to Tetris: Axis' gameplay. Here the player moves around in a circle with their 3DS in tow to guide the climber in this augmented reality version of Tower Climber. The pair of AR modes are impressive to play, but I've had it where the 3DS is finicky about reading the card placed down on the screen. It's challenging to keep the camera locked on the card. Players' high scores can be uploaded to the internet, and they can view their top times and high scores in comparison to the world or their group of friends. They can also hop online and do battle against seven other competitors, using items to trip up their opponents. Items include the Cascade which fills spaces that are open on the Matrix, the Color Change item that transforms every block into the same color, Color Bonus which puts check marks on individual boxes-- the lines cleared with check marks give the player a higher score than those without-- there's the ultra-powerful Switch item that exchanges a player's Matrix with another's, the UFO that deletes blocks from a player's board, and Fog which for a limited time obscures every enemy's Matrix-- to name several. When a player has lost, they can send out a message to everyone in the room. Play locally with one game card or against the entire world! Compared to Tetris DS, Tetris: Axis might be considered a bland alternative. 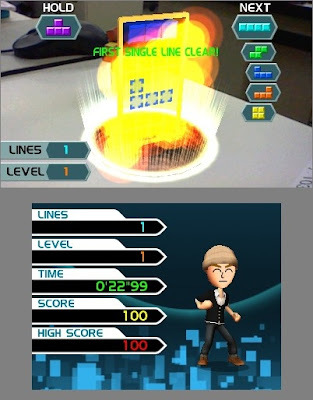 Sure, one can assign their Mii to the bottom screen to boogie and cheer the player on as they stack Tetriminos in the various game modes, but that can't hold a candle to the Nintendo-themed modes of the DS iteration. The backgrounds of Axis are especially trippy from Town Lights to Black Hole to Layered Planet. The 3D effects are particularly impressive though they aren't used in some modes for obvious reasons like Jigsaw where the picture show is just a 2D image. The soundtrack while playing is made up of remixed classical tunes such as Dance of the Sugar Plum Fairy, Waltz of the Flowers, Korobeiniki & Trepek (the main theme of the Tetris series), Flight of the Bumblebee, and Swan Lake. boogie as you stack Tetriminos. 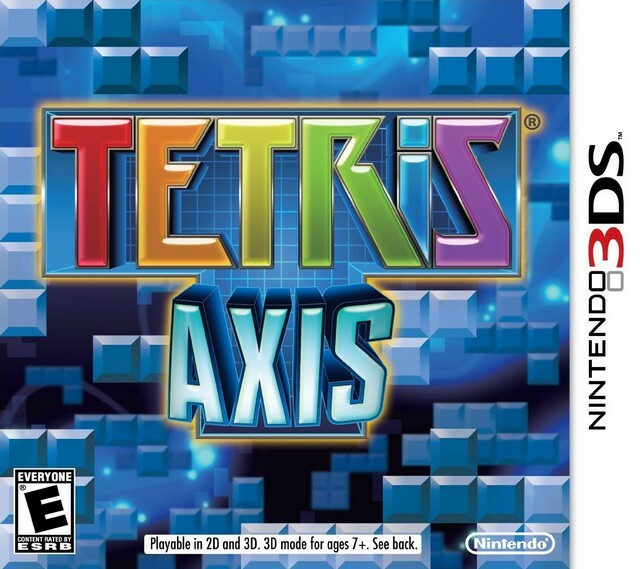 Overall, Tetris: Axis is an admirable entry to the long-running franchise. If you don't mind the Nintendo aesthetics being replaced with Bomberman, Miis, and flashy generic backgrounds, then you'll find a lot to love about this 3DS version. This is the perfect "pick up and play" game. The online is smooth and enjoyable even if one particular item is overpowered, the twenty modes offer longevity, and the presentation is pretty nice. For thirty dollars you could do a lot worse than this installment of Tetris.